PRO AR Corey Rockwell admits it was a privilege to reach the milestone of 200 Major League Soccer assignments when he ran the line at Colorado Rapids versus Real Salt Lake last weekend. Rockwell has taken part in 189 regular season games, 10 playoffs and one MLS All-Star match since his debut in 2005. His success has also seen him win MLS Assistant Referee of the Year in 2011, and to a place among the officiating crew for the US Open Cup Final in 2012. The 41-year-old says his special assignment last Saturday went largely to plan, even if it did provide a rare moment of humor. “The game went well and Edvin [Jurisevic] did a great job in the center. Our goal that we talked about pre-game was to get the big calls correct and I believe we did that,” Rockwell told proreferees.com. “The one odd thing that happened in the game is I sprinted down the line in the 38th minute for a breakaway and stepped on the corner flag, which then completely broke. “If you look carefully on the TV, I am actually holding the corner flag up manually while Javier Morales of Real Salt Lake takes his corner kick right next to me. That was my first broken corner flag in 200 games! Ten years with the flag has seen Rockwell form many strong relationships with PRO and other refereeing colleagues, having started out alongside some of the most successful officials – something Rockwell holds dear to himself. One of his stand-out memories was his assignment to the MLS All-Star game involving Manchester United in 2011, when he had another light-hearted moment to cherish in another landmark game. “The most memorable games are those when I run the line for a referee for the first time,” he added. “I was able to be AR for several officials in their first game, including active PRO referees Ted Unkel and Fotis Bazakos. These games I get most excited and nervous about because I want to serve them perfectly with no mistakes and play a small part in getting them more games. “I would be remiss if I did not mention one other memory, where I was not standing but instead laying down! Due to a sudden change of ball trajectory, I lost my footing and ended up ‘planking’ on the line in the 2011 All-Star game. Rockwell, like many others on the PRO roster, started out with ambitions of playing the game of soccer, but soon switched paths to officiating. His route to becoming an AR then hinged on a self-examination of his skill set, where he felt his attributes were better suited to running the line. 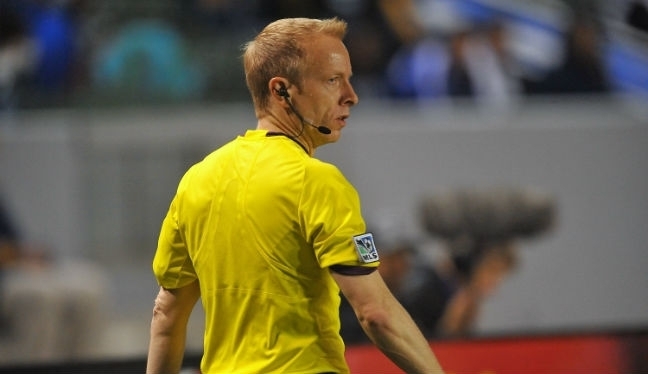 Now, he takes pleasure from making the center referee’s life as easy as possible, and the Arizona-based AR still feels he has plenty to achieve in the officiating world – a mission that continues this weekend when he forms part of the crew taking charge of FC Dallas versus D.C. United. “Once I realized I couldn’t pay for college by playing, I switched to refereeing and have been refereeing now for the past 25 years. As to why I chose the AR path versus a referee path, I did an honest skills assessment on myself, and while I was being picked to referee in National Youth and Adult Tournaments, I did not see myself as being as strong as the referees I looked up to at the time: a Brian Hall, a Michael Kennedy, or a Kevin Stott – they had something that I simply did not possess. “However, I did have some good sprinting skills and I get just as much of a thrill, if not more of a thrill, helping the referee in the center succeed in a game. So, I told Alfred Kleinaitis and Paul Tamberino that I wanted to pursue the AR path. From there, they assigned me to some more tournaments and preseason games as an AR, and things went well from there.